The countdown to the world’s largest gathering of anti-fraud professionals is on. More than 3,000 fraud fighters from around the world will gather this month in Baltimore to share the latest insights into fraud prevention, detection and deterrence. This year’s keynote speaker lineup offers insight and inspiration across a range of topics and includes Assistant Attorney General Leslie R. Caldwell, data breach expert Brian Krebs and Lesley Stahl, co-editor of “60 Minutes.” These special guests lead the lineup of an impressive list of more than 50 experienced practitioners that will be presenting during the conference. With a focus on building practical skills and providing valuable takeaways, speakers incorporate their real-world experience into these sessions, often using case studies to illustrate techniques and outcomes. During the Main Conference, June 15-17, you will have the opportunity to customize their schedules by choosing from more than 70 unique educational sessions across 13 tracks. The wide range of topics touches on nearly every facet of occupational fraud, from financial statement manipulation to corruption risk to alternative currencies, with sessions for all levels of experience. The psychology of fraudsters in one of the most popular topics year after year, and there is no better way to understand the motivation and mindset of a fraudster than to hear from one directly. This year’s event will close a first-hand perspective from a former accountant and convicted fraudster Nathan Mueller, who embezzled more than $8 million from his employer. 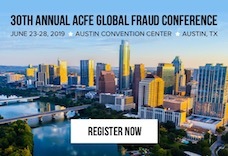 The 26th Annual ACFE Global Fraud Conference also offers an unmatched opportunity to expand for attendees to expand their professional networks through special events, networking breaks and industry-designated tables in the General Sessions. A highlight of the conference for many is the chance to mingle during the ACFE Foundation Networking Reception. This year’s reception, which is complimentary for all attendees, will be held at the Baltimore Convention Center immediately following educational sessions on Tuesday, June 16. The new format of the reception makes this opportunity accessible for more attendees and allows free time on Tuesday evening for informal meet ups, exploring Baltimore or taking in a game during ACFE Night at Camden Yards. Between educational sessions, attendees will have the opportunity to explore the solutions and services in the Anti-Fraud Exhibit Hall. With more than 50 vendors, the exhibition offers a one-stop resource to discover new solutions and services to support your fight against fraud. For attendees that want to a look at anti-fraud technology in action, the exhibit hall’s Software Showcase will feature live demonstrations by leading providers, including IMC, Caseware Analytics, Softlake Solutions and Splunk. Don’t miss your chance to attend. Register today at FraudConference.com.